Crizal Forte UV is the first clear lens on the market to maximise your eyes protection against dangerous UV aggressions from the front and back surface of the lens, while ensuring the best enduring clarity of vision. 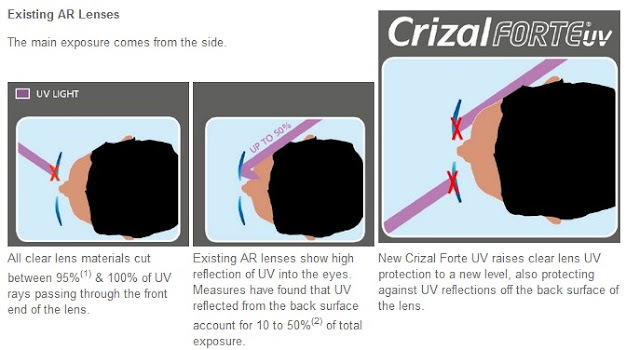 Crizal Forte UV protects the eyes from UV rays reflected off the back surface of the lens and also protects against the five enemies of clear vision, shown below. In a nutshell, the Crizal Forte UV is a clear eyeglass lens offering the most advanced protection against damaging UV light. This exclusive lens blocks UV rays entering the eye from both front and back sides while maintaining clarity of vision. A new "Eye-Sun Protection Factor" for lenses are introduced here. Check it out below. The E-SPF provides a simple yet effective way to grade the total UV protection offered by a lens. Existing "100% UV Protection" claims refer only to UV transmission from the front of the lens. Yet harmful UV rays can come from all directions. There is currently no index that measures sun protection from both front and back of the lens. Essilor has worked with an independent 3rd party to develop a relevant protection index, based on a series of experimental measurements taking into account both front and back UV protection. 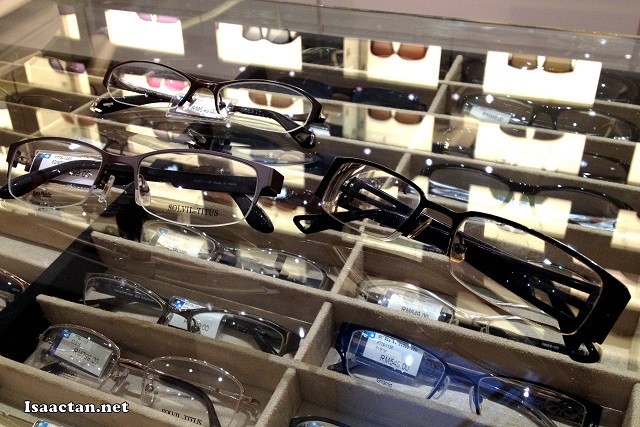 The index measures "How Much More" protected is the wearer compared to not wearing any lens. Essilor Crizal Forte UV lens has an E-SPF rating of 25, meaning the wearer is 25 times more protected than without any lens. Now that's a pretty nice thought, since I'm always out and about under the hot sun. Do check out www.espf.com on a more comprehensive explanation on the E-SPF. Another feature of my Crizal Forte UV lens which I appreciate was their improved scratch resistance. You cannot imagine how many scratches my previous glasses had to suffer. Coming into the 8th month of owning this eye-wear, I'm happy to say there is no apparent scratches to be found yet. The Crizal Forte UV lens integrates a unique scratch resistance booster (SR Booster) which acts like an intermediate layer resulting in a strong coating against scratch. It has a 50% better scratch resistance than the Crizal A2, and as good as Mineral (Glass) lens with AR. Overall, I might say that my experience with this new lens has been satisfying. Would I recommend this lens for others? Yes, of course. Do remember to ask the optical shop you're making your new glasses about Crizal Forte UV, and be awed. Also, I will be holding a short contest in my subsequent post for a chance to own this lens for free! Do wait up for it.